A lot of people look for jobs at big companies because they can be great places to build a solid career. Unfortunately, if we measure the size of a company in terms of annual revenue, there may not be a lot of options in the state where you live. Check out our new map to compare the size of the largest companies headquartered in every state. The data included in our map is based on company filings as well as estimates of private company figures from S&P Capital IQ. The numbers come from 2017, the latest year for which information is available. We adjusted the size of each state to reflect annual revenue—the larger the state, the more revenue its largest company generates. We then color-coded each one for easy reference and added the annual revenue figures, creating a unique map of the American economy. Walmart (headquartered in Arkansas) immediately stands out for obvious reasons: the company brings in $486B in annual revenue, more than twice as much as the second-biggest company, Texas’ ExxonMobil ($226B). 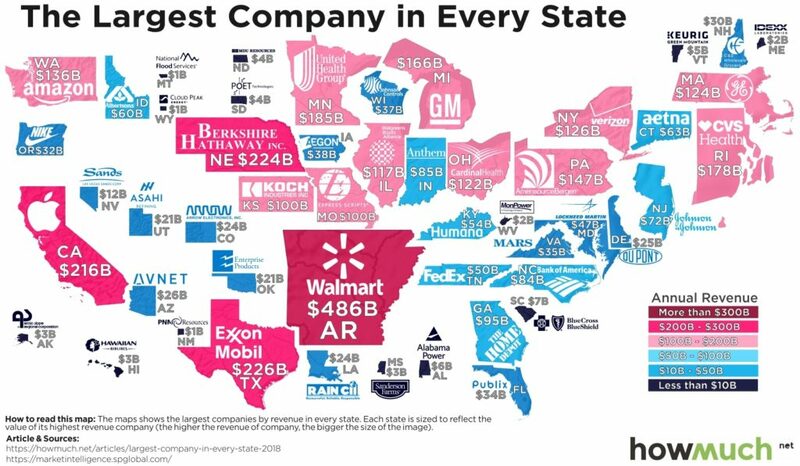 Arkansas is also located right in the middle of the country, making Walmart’s dominance seem even more noticeable than other well-known behemoths like Berkshire Hathaway in Nebraska ($224B) or Apple in California ($216B). Of course, Walmart makes its money through its thousands of stores located across the country, but all the revenue is counted in Arkansas because of the location of its home office. There are several notable trends in our map, too. The Northeast contains quite a few blue states, indicating that the largest companies did not crack $100B in annual revenue. Rhode Island actually takes first place in the region thanks to CVS Health ($178B), surpassing even New York (Verizon, $126B) and Massachusetts (GE, $124B). The Midwest similarly contains a mixed bag of companies. Some are extremely large organizations with household names, like GM in Michigan ($166B) and UnitedHealth Group in Minnesota ($185B), and yet other states have large companies that are nowhere near $100B, including Aegon in Iowa ($38B) and Johnson Controls in Wisconsin ($37B). Perhaps a lesson to be learned is that big companies are often headquartered together in the same states , but the same may not necessarily be true in neighboring states. Think of how many other $100B companies are in California and Texas, for example. In another region, the Southeast disappoints with not a single company headquartered east of the Mississippi breaking $100B. Look, for example, how small Mississippi appears when compared to Arkansas. When a poultry company (Sanderson Farms) is the state’s largest employer by revenue ($3B), that says a lot about the region’s economy. The Southwest and Northwest similarly contain very few large companies, outside of Texas, California, and Washington (home to Amazon, $136B). Let’s take a step back and break down the top ten states ranked in order of revenue earned by their largest companies. Clearly there are a lot of states without any exceptionally large companies, while there are others like California and Texas with several companies generating hundreds of billions of dollars in annual revenue. Of course we should mention that revenue is a different metric than profit, which is probably a better indicator of a company’s staying power. That being said, however, revenue figures do provide a great way to compare companies in different industries and parts of the country. So if climbing the corporate ladder at a big company is your idea of a great career, we recommend moving to a state where a $100B+ company is headquartered as fast as possible.